Slippery Maple: Tree Service Bellingham WA | DigLynden Tree Service WA, but as I entered the maple tree it stopped and remained rain less for the rest of the day. Got this call last week. Jim’s neighbor has been threatening to sue him if he didn’t take care of a maple tree leaning toward his house. Pretty sure he really couldn’t do anything but as a good neighbor and not wanting not to be harassed any longer, Jim called his tree guy, Dan. That’s not me. Guess Dan only has license and bonding for tree service work in the summer and the neighbor required it, so Dan gave Jim my name. I have been so busy that I don’t have time to go look and do estimates for $200ish jobs. I will go do them but I just give people a range of between $200 and $500. 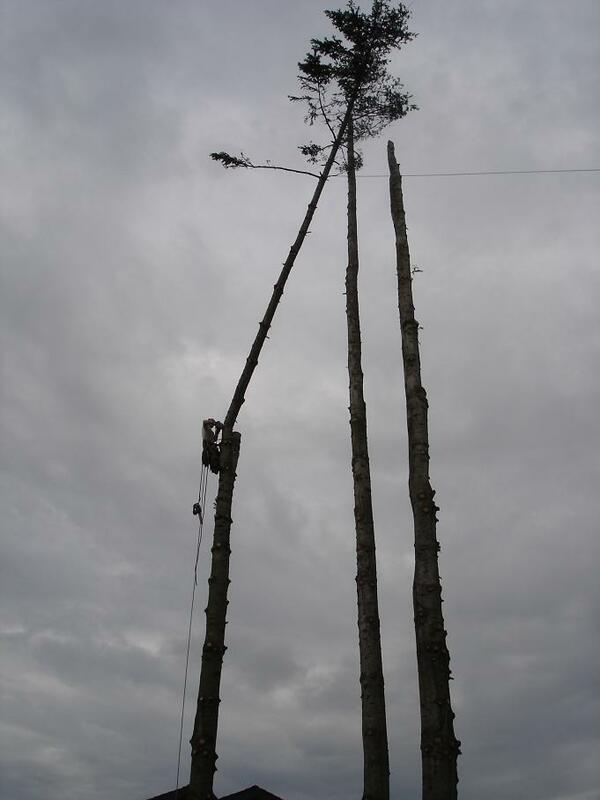 People looking for tree service work in Bellingham WA are usually good with that approach. Back in the maple tree. Boy this tree was slippery. Jim, the home owner, asked if I have ever fallen out of a tree. You know, that’s just a question that doesn’t need to be asked right before climbing a wet slippery maple tree pole. He must have dropped the F bomb, fall, four times before I cut him off and said we don’t use the F word on my jobs, and that I was going to fine him $50 for each one, if he did it again. Down in the Geneva area of Bellingham WA, and there are lots of big trees. Couple challenges with this one: a very light weight fence below and Japanese Maples that I couldn’t crush. No problem, got the tree dismantled in two hours. I must have kicked out of the tree 20 times, a record. What that means is that both my gaffs kick out of the tree at the same time. The maple tree was at a difficult angle for where I needed to positioned to cut and slippery as a greased pig. One of the safety techniques I employed on this Bellingham tree service job was to double rap a second flip line around the tree. The primary steel core flip line I use won’t allow for that technique. By double wrapping, it prevents me from sliding down the tree if my gaffs kick out, and they did. Jim wanted to break the payment into two payments. People are tight. Spending money but it just seems like lots of people are spending all they earn. He was surprised that a tree service company would take credit cards. Got his card, called my processor, approved, thank you very much. Enjoyed the conversation with Jim. Thank you Bellingham, for all the tree service work. The referrals I get lets me know you appreciate my effort and quality of tree service. help you evaluate if your timber has value. Call us 360-318-9795 Thank You! 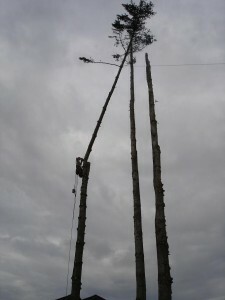 This entry was posted in Uncategorized and tagged bellingham, removal, service, tree, tree service bellingham wa, wa. Bookmark the permalink.